Please consider following us on Twitter and Facebook for updates on our progress. 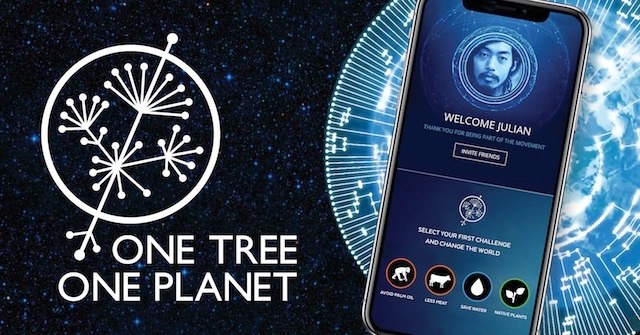 We're delighted to work as a partner to the One Tree, One Planet project providing their tree of life visualisations. We now release a One Tree, One Planet view as part of a new version of OneZoom. Version 3.3 includes all the features of version 3.2 and adds a new Polytomy view as well as performance enhancements, changes to the way images are processed to enable compatability with the latest version of the Encyclopedia of Life, and specific developments to support the One Tree, One Planet tree view. Pavel Linhart builds releases a version of OneZoom incorporating the sounds of 41 Tetrapods - built from OneZoom V1.2 kiosk available from our developer page. 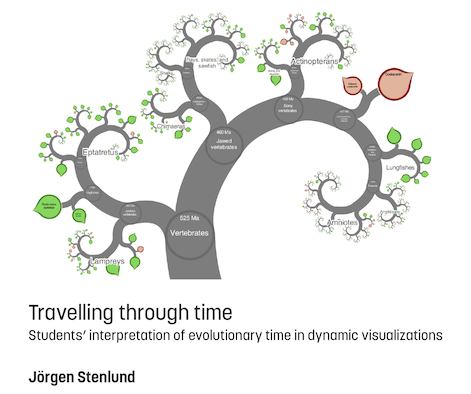 Jörgen Stenlund, student at Linköping university uses OneZoom on the front cover of his thesis concerning visualizations in teaching evolution. Linnean Society Tree released. This has all the same species as our original complete tree of life, highlights popular places associated with Carl Linnaeus and we have plans for further improvements in future. The money raised from sponsorship of leaves on this tree will be shared with the Linnean Society of London (further details when you try to sponsor). We can provide customised trees like this as free service for other charitable organisations whose aims are similar to our own: please ask for further details. The OneZoom tree of life explorer version 3.2 released.... it features an all new user interface to the tree, publicly available source code under a OneZoom non-profit source available license, and a documented framework enabling others to easily design a complete OneZoom tree into their website or public display without needing to touch the core software. A lot has changed behind the scenes as well including use of a new testing framework to put new releases through their paces before we make them live on our main site. Science On Tap: Tree of Life Movie Night at the Florida Musuem. This event featured an interactive "One Tree, One Planet" projection of the tree of life, created using the OneZoom tree visualisation engine. The total number of unique users of our website just passed one million. Thank you so much everyone for your support. Still, we feel we're only just getting started, so watch this space for much more! OneTree, One Planet: a projection of a version of the OneZoom tree of life onto the Florida Museum of Natural History. Produced in collaboration with Naziha Mestaoui, James Oliverio, Doug Soltis, Pam Soltis, Robert Guralnick and Pavlo “Pasha” Antonenko. Picutred above is a screenshot from the OneZoom One Planet show featuring an adaptation of one of our new view types. This view supports display of polytomies: places where a branch splits into more than two parts. New views will be released for exploration in OneZoom soon. 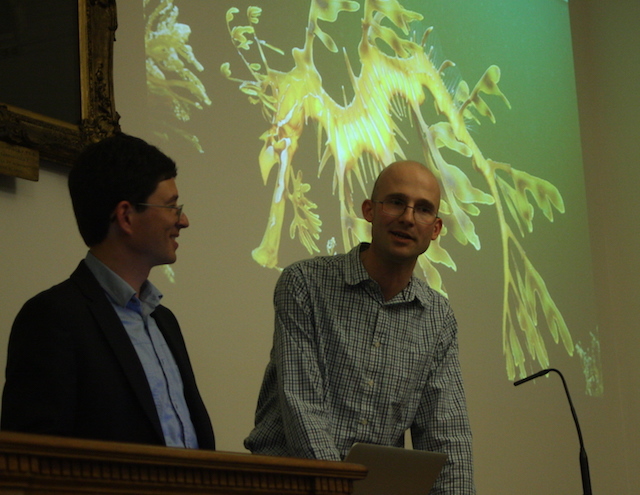 OneZoom is delighted to announce the start of an ongoing formal collaboration with The Linnean Society of London. 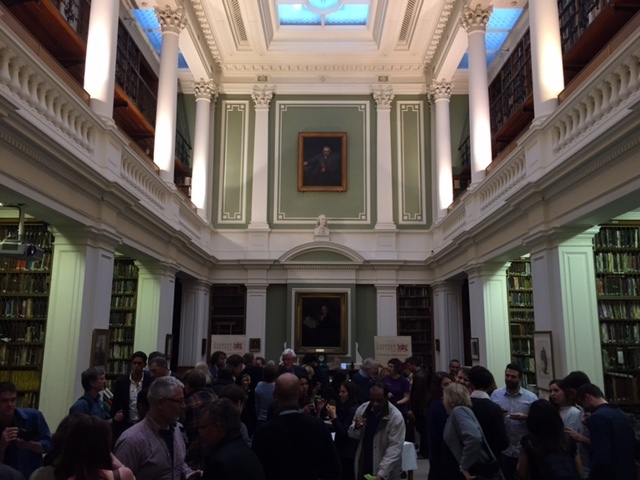 This follows two very successful joint events during 2017 focused on the tree of life and hosted at the Linnean Society. 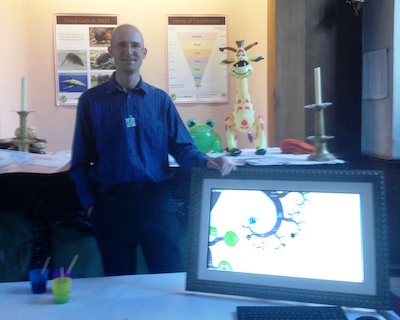 OneZoom is used by Kew Gardens Plant and Fungal Tree of Life project at Kew Circle of Benefactors event. Photo by Tuula Niskanen, Kew. We're at Curiosity Carnival Oxford Botanic Gardens. Our latest code (OneZoom verison 3.2) is now avaialable for public viewing on GitHub in a new repository. OneZoom is on display at the Ancestor's Trail event in Epping Forest, UK. OneZoom is on display at the Oxford Botanic Gardens for International Fascination of Plants Day. A special celebratory lecture at The Linnean Society of London to mark a year since the launch of our first explorer for the complete tree of life. This lecture will tell the story of the tree of life and how modern technology has overcome the challenge of turning it into something tangible that anyone can explore. Along the way, we will journey into some of the more obscure areas of the tree, meet some of the extraordinary organisms that dwell there, and learn how they came to evolve. OneZoom version 3.1 released with new updates including better performance on touch screen devices and basic multi-language support on the tree. The biggest changes, however, are in the parts behind the scenes that you don't see - especially in our main visualisation code which has now been completely refactored and modularised. Completion of graphic design projects with Prof. Silvio Barta and the class of 2017 in Media und Communication Design and Media Management at Macromedia University of applied sciences. These projects were based on OneZoom and included recommendations for future improvements to the graphic design and user interface elements of the OneZoom website. 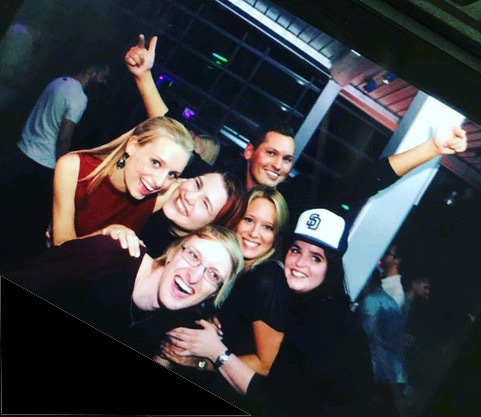 Thank you very much to all the students involved... Sandro Anton, Sumayyah Balamesch, Nadine Bolman, Maximilian Böttger, Anna-Sophia Bruhn, Sascha Ebson, Ann-Katrin Erich, Daniel Greßmann, Melina Harneid, Kristel Khan, David Lichtenberg, Linus Nolte, Michelle Orlik, Jan Nicki Prostka, Arndt-Fabian Rolfing, Marc Rosenberg, Dennis Schrader, Lailoma Sharifi, Andreas Sleziona and Alexios Triantafyllidis. OneZoom received a certificate of commendation from the UK National Co-ordinating Centre for Public Engagement after having been long-listed for their 2016 Engage Awards. The judges described OneZoom as "An ambitious and complex project, which has been tackled well, producing a useful and impactful resource." New updates to the OneZoom software went live today. We now have improved pages that allow you to browse and sponsor a species of your choice from any particular group, such as Mammals, or any common ancestor in the tree. We've made some other behind the scenes improvements too. OneZoom now relies less on third party web services and includes fail-safes that ensure better data accuracy. OneZoom at the Eco Fun Palace, London with James Rosindell. Displayed in association with the Linnean Society. 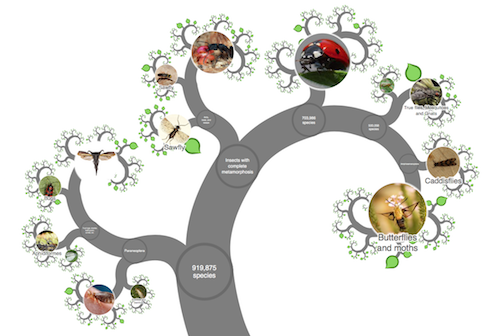 A huge upgrade to OneZoom is now live enabling it to display the complete tree of life with 1.8 million species (everything except extinct species, and eubacteria). As with version 2.0, the tree and its contents are continually updated with the recent scientific information. A really big thank you to everyone who sponsored a leaf of the tree, your donations made this possible. There are loads of great leaves on the tree still available to sponsor, please consider helping us make OneZoom even better. Jonathan Sutton joins the OneZoom team as a software developer intern for a 6 week summer project. The Ancestor's Trail, UK 2016. The OneZoom charity was supported by the trail this year and the science presentations included a talk given by Yan Wong and James Rosindell. OneZoom was at the Cheltenham Science Festival in the Discover Zone. We were also featured as part of the Ancestor's Tale presentation by Richard Dawkins and Yan Wong. Release of a massively upgraded OneZoom, the biggest step forward by far since the original release of the software in 2012. Now with more life than ever: the tree spans the whole of life (except for some bacteria). Includes images throught the tree and an improved visual design. Includes a new user interface, easier to use and with mobile support. You can now sponsor a leaf on the tree and your chosen name will appear on that leaf of the tree. Semi-automated systems are now in place for keeping all this information up to date. 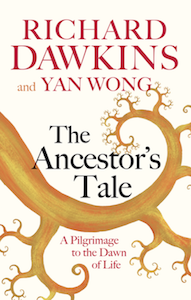 The release of OneZoom version 2.0 coincides with the date of publication of the The Ancestor's Tale second edition by Richard Dawkins and Yan Wong. This seminal book on evolution uses graphics from OneZoom on the cover, and throughout. 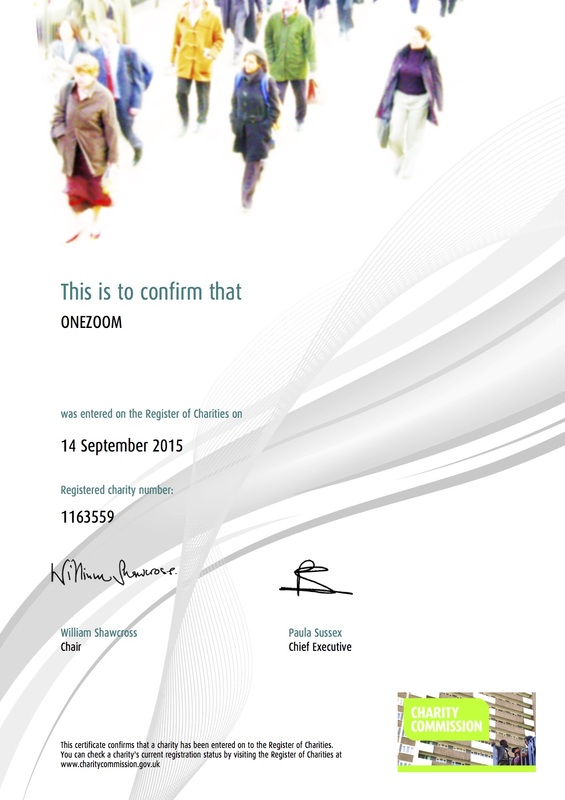 OneZoom is now a registered charity in the UK, our registration number is 1163559. Our formal objective is To advance the education of the public in the subjects of evolution, biodiversity and conservation of the variety of life on earth. The founding trustees of the charity are James Rosindell, Luke Harmon and Yan Wong. A OneZoom based musem display features as part of the just opened Wild Planet exhibition at The Australian Museum in Sydney. 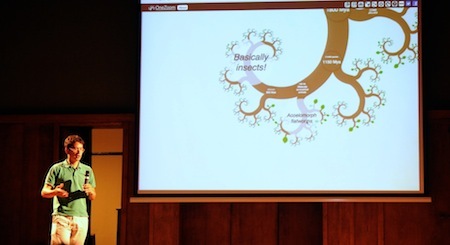 Public presentation about plant evolution by James Rosindell at The Ancestor's Trail, UK 2015 http://ancestorstrail.org.uk features OneZoom throughout. The University of Wyoming Biodiversity Institute now features two OneZoom displays in its public exhibition area, one showing tetrapods and the other showing plants. OneZoom was at the Cheltenham Science Festival yesterday. 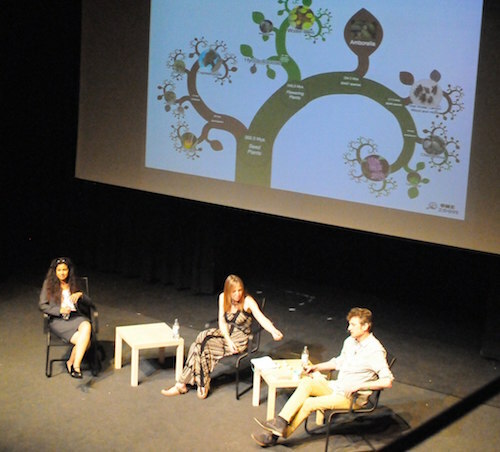 As part of the Tree of Life presentation by Alice Roberts, mammalian expert Anjali Goswami and plant expert Jeremy Pritchard. Then later in the Times talk corner on a large touch screen for visitors to explore. A version of OneZoom for genealogy is launched today at ZoomPast.org. 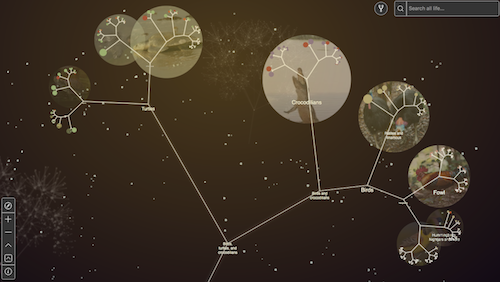 This is a new and unique way to visualize and share genealogies in the same way as you can explore the tree of life with OneZoom. 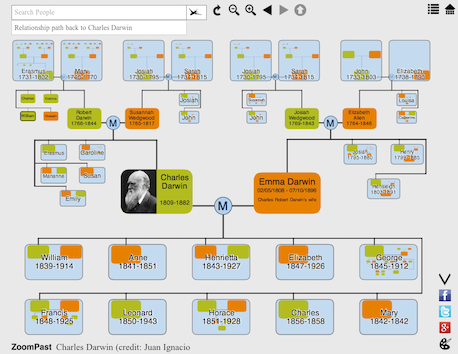 You can explore example genealogies of famous and fictional characters including Darwin, British Royalty and various US presidents, or build your own genealogy and share it with family and friends. OneZoom is featured on the BBC world service as part of the Science in Action program listen now (The OneZoom part in 19 minutes into the show but it's all interesting - the title says 'gene expression changes with the seasons'). 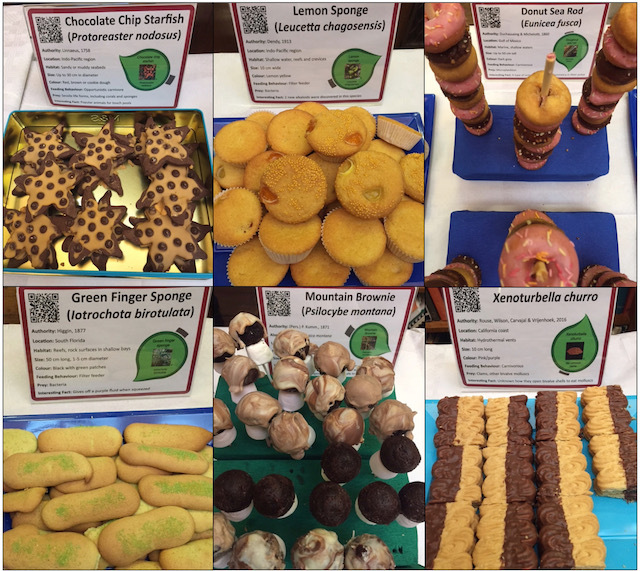 OneZoom is at the Imperial Festival in London. Our stand featured a live Axolotl, carnivorous plants, a grain of wheat for every described species on the planet, and OneZoom on a large touch screen. The OneZoom concept has led to another application: you can now build your own family tree and explore the family trees of famous people in a OneZoom inspired way at ZoomPast.org - currently in beta testing. New work published today by James Rosindell and Laura Nunes from the OneZoom team, together with Sam Turvey from the Zoological Society of London ranks bird species in priority order for conservation based on their evolutinoary distinctiveness and the economic costs of protecting them. See a OneZoom visualisation of the results here. The brown colored branches link to 206 threatened species that were evaluated, which are coloured in red. Zoom into any leaf to see where that species ranks and why. Read the press release and article here. Professor Mike Steel uses OneZoom in three public presentations in New Zealand at Nelson, Wakatipu college in Queenstown and Wanaka. Received 600,000 page views from over 200,000 unique users in 196 countries. Formed a major part of 4 long-term and permanent public outreach exhibitions at musuems, libraries and other venues. Released a free Android app. Appeared at 4 science festivals. Been shown in 5 public outreach presentations. Appeared in at least 77 instances of media coverage. Been used in at least 10 other software projects. Built an embed function so you easily have OneZoom as a feature in your own website. We're not slowing down and have several ambitious plans for our third year, watch this space. Our free Android app is out today - available for download from the Google Play store . Simply search for “OneZoom” in the store. Now at last you can experience the main features of OneZoom from your mobile device. OneZoom is at the Ancestor's Trail and is used by Dr. Yan Wong in his evening presentation on the Tree of Life. OneZoom is at the Cheltenham Science Festival as part of the British Library's Beautiful Science exhibition until 8th June. Just released: a OneZoom visualisation of conservation rankings for all the world's bird species. The rankings prioritise species that are both Evolutionarily Distinct and Globally Endangered (EDGE). This visualisation was brought to you in collaboration with the ZSL EDGE project and the authors of Jetz et al., Global Distribution and Conservation of Evolutionary Distinctness in Birds, Current Biology (2014). OneZoom features at the Science Festival "WowHow" at the Oxford University Musuem of Natural History. OneZoom is at the British Library as part of their amazing Beautiful Science exhibition. 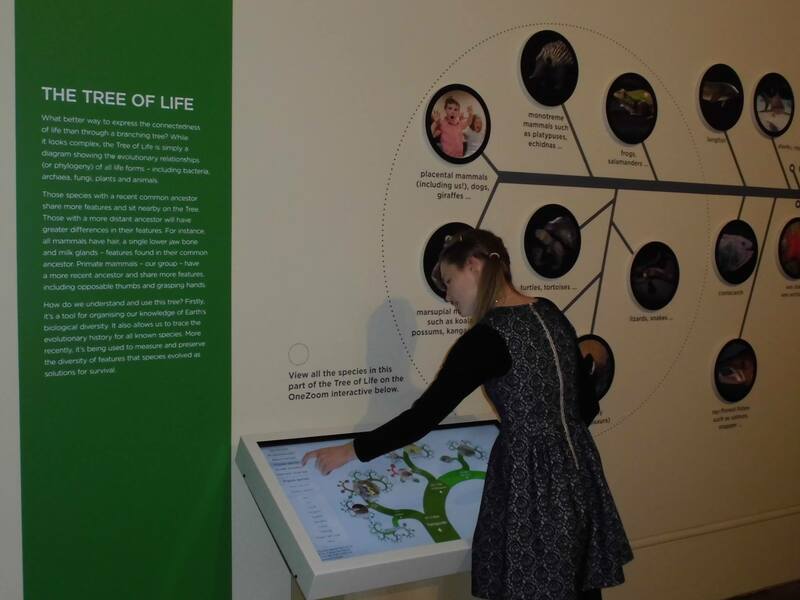 You'll see OneZoom on a pair of multi-touch displays with embedded images and sounds alongside a first edition copy of Darwin's On the Origin of Species and many more amazing examples of data visualisation. The exhibition is open until 26th May 2014. OneZoom featured as a learning tool in a glass classroom demonstration as part of Intel Education at Bett 2014. The teacher running the demonstration was Michael Hanson, vice principle of the Scotts Valley High School in California, USA. In a meeting aftewards he said of OneZoom that In my opinion, it's the best visualisation of evolution that's out there for the lay person . 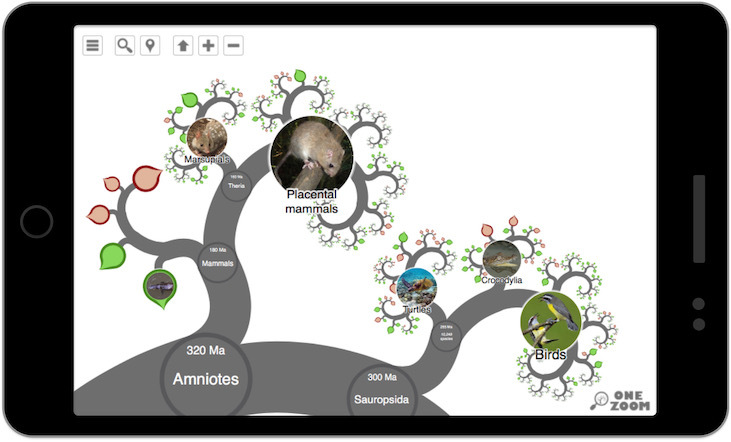 A new tree with over 31,000 species of seed plant is now available on OneZoom. We worked with the authors of the new tree data to release this at the same time as their research unveiling the tree was published in Nature (See Zanne et al. Nature. doi:10.1038/nature12872. - 2013). The colouring of this tree indicates whether each plant is wood, herbaceous or variable. Major updates to OneZoom website including a refactored and improved software core and the new embed and link tool. OneZoom is one year old today, in the last year almost 130,000 people have visited OneZoom from 182 different countries and we've done a lot to improve and expand our content. We have even more planned for the next year - watch this space. Independent reseach conducted by academics at Harvard University and Massachusetts Institute of Technology ranked OneZoom as the fourth most memorable visualisation image out of those tested. The researchers conducted an extensive study of over 2000 visualisations, they conclude that "quantifying memorability is a general metric of the utility of information, an essential step towards determining how to design effective visualizations". The publication titled "What Makes a Visualization Memorable?" was published by the IEEE Computer Society. Kai Zhong joins the OneZoom team as a full time software developer. 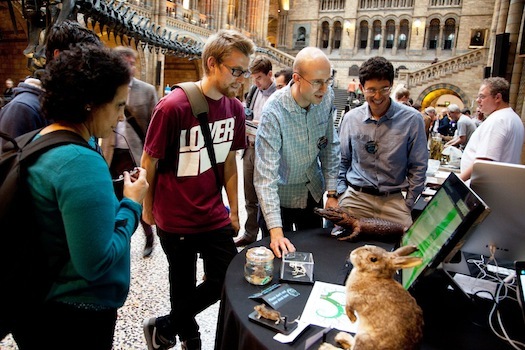 OneZoom attended the Science Uncovered at the Natural History Musuem in London for three days where OneZoom creator James Rosindell, and science broadcaster Yan Wong were demonstrating the tree of life to members of the public. This is the fourth public outreach display of OneZoom. 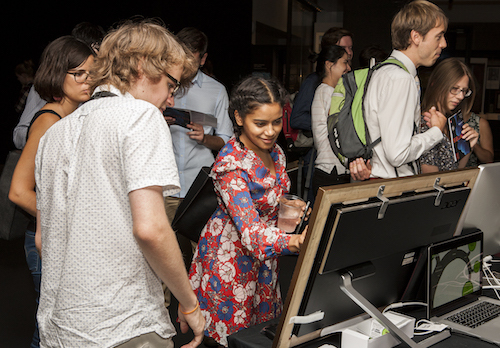 OneZoom was at the Imperial Festival for three days where OneZoom creator James Rosindell, and Imperial College masters student Laura Nunes were showing the tree of life to members of the public. This is the third public outreach display of OneZoom already and we've got a lot more planned - watch this space! An exhibition about science and aesthetics opens at the Museum of the University of Tuebingen in Germany. Open until the 1st of September this year, the exhibition features our OneZoom open source software as a key interacitve with the tree of Mammals, Amphibians, Birds and Reptiles combined (Tetrapods). 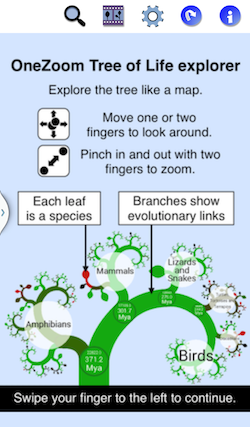 We now have a plant tree for you to explore in OneZoom! At this moment it's in Latin only, but we plan to include common names and additional information later. Many thanks to distinguished Professor Doug Soltis for providing the tree data for this work. Explore the plant tree now. OneZoom attended the Biology Vizulalisation Conference VIZBI 2013. OneZoom appeared as a central theme in the conference promotional material and won the prize for best poster - decided by popular vote. See the poster on the VIZBI Website which was accompanied by an interactive display of OneZoom at the conference. Simon Fraser University get the worlds first permanent installation of a OneZoom display (press release). Explore an online version now - SFU staff are highlighted showing which species they work on, you can search for both species and researchers by name too. The online version is not the same as the display version but it contains the same information. We hope this is the first of many OneZoom installations and that the software contines to develop for these uses. If you want a display for your university please contact us. The complete tree of tetrapods is now available on OneZoom. That's over 22,000 species of amphibian, reptile, mammal and bird covering all well known species and approximately 70% of the total number of described tetrapods. We're still going to continue to improve and extend this tree and we also plan to add fishes to make it a complete tree of all vertebrates. OneZoom presented by Rosindell at the Naturalis Biodiversity Centre annual conference as the after dinner plenary speaker. OneZoom adds the bird tree with nearly 10,000 species of bird. 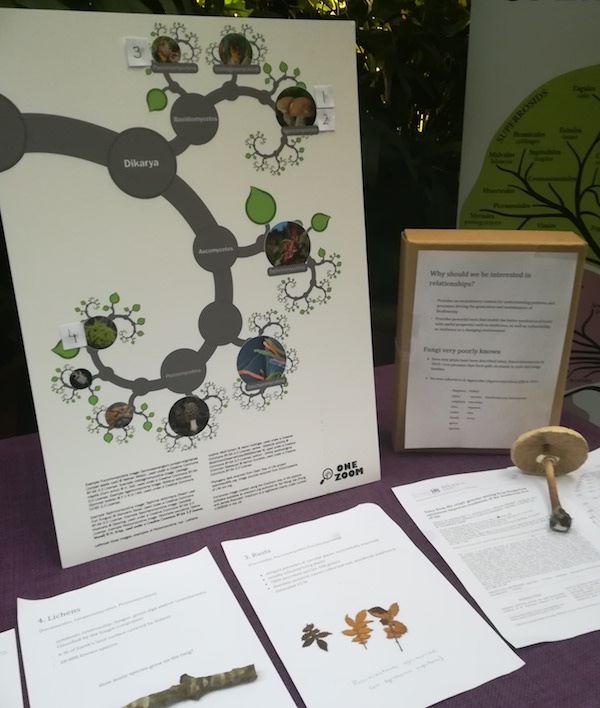 Thanks to Walter Jetz, Gavin Thomas, Jeff Joy, Klaas Hartmann and Arne Mooers for producing the tree in their recent publication The global diversity of birds in space and time and for using our software to show the tree on their own website birdtree.org. Thanks also to Laura Nunes, masters student at Imperial College, for all her voluntary work preparing the bird tree for use at OneZoom.org. OneZoom presented at the British Ecological Society annual meeting 2012. OneZoom is one month old. 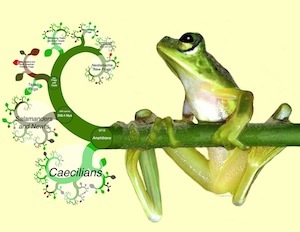 To celebrate we've got the tree of amphibians for you with over 5000 species to explore. 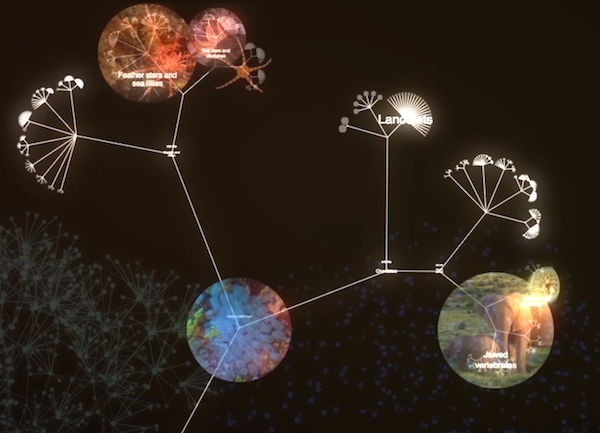 The next addition to OneZoom that we expect is the tree of birds with nearly 10,000 species. Website updated: new videos and screenshots, an improved news page format and extra details on how to embed and reuse OneZoom. New feature: OneZoom updated for easier use based on your feedback, thankyou everyone! Now you can scroll, click or use the icons to zoom in. We're still working on more improvements. After 24 hours online OneZoom got 13,900 unique visitors and 36,400 page views. Thank you so much everyone! 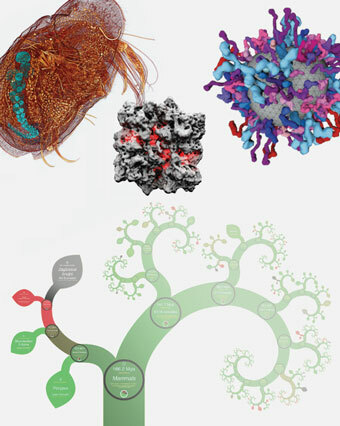 The OneZoom manuscript is published in PLoS Biology, the first in the journal's new "Cool Tools" series. The OneZoom website and software go live. Big data is a growing issue in Science and Industry. Modern computing has enabled large amounts of data to be captured and stored and has revolutionised many branches of science. These advances, however, lead to challenges, such as how to explore and visualise large data sets. The very first blue-skies idea that could have been identified with OneZoom was that of a mind map so vast that it could contain all human knowledge. 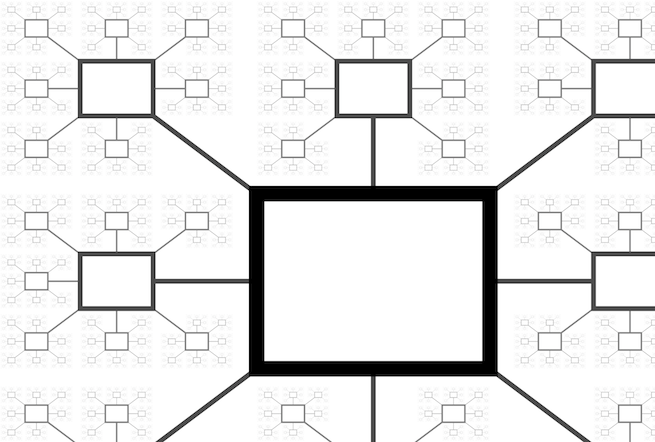 The concept involved making the information easy to explore by laying it out in ever smaller bubbles using a fractal structure and a zooming interface so that the computer never runs out of space to put the information no matter how much there is. The idea was untouched for some time until one day, James Rosindell visited Charles Darwin's Down house with Luke Harmon who he was working with on a number of scientific projects. Luke in particular made a big deal of their walking down Darwin's thinking path and said that they should try to think of a new idea to commemorate the occasion. The photo shows James (left) and Luke (right) in front of Down house, taken just after their lap of the thinking path. It is unfortunate that none of the ideas they discussed whilst actually on the thinking path have led anywhere yet, but it was less than two hours later when wandering around central London that the topic of tree visualisation came up and James suggested a possible way to visualise the tree of life based on an adaptation of his fractal mind map idea. James initially worked on coding OneZoom only during his spare time, taking advice from Luke in particular, but also from many others. After that, James further developed OneZoom as part of his research program at Imperial College London, which is funded by a research fellowship from the Natural Environment Research Council (NERC).